From left to right: Tybalt (Celene Harder) and Mercutio (Val Duncan) bring their side of the story to life in Valour & Tea’s Mercutio & Tybalt. Photo Credit: Chris Tait. William Shakespeare’s Romeo and Juliet has seen its fair share of adaptations and retellings, but none, Mercutio (Val Duncan) says, have come even close to the truth. For how many know that Mercutio and Tybalt (Celene Harder) were actually close friends? 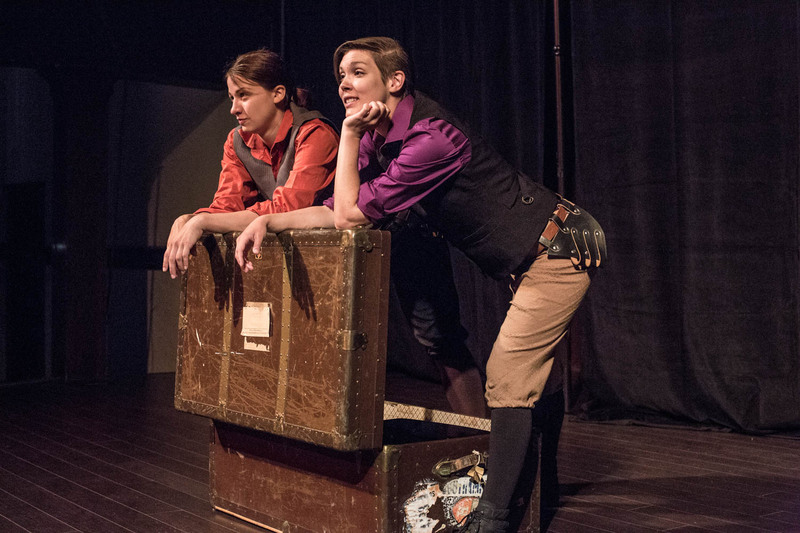 That is the premise of Valour & Tea’s newest work Mercutio & Tybalt, a hilarious reimagining of Shakespeare’s most popular play. Written and directed by Duncan and Harder, Mercutio & Tybalt catches up with the titular characters in the afterlife. Still bitter about the fact that the story of two dumb, hormone-crazed teenagers has endured the last 400 years, Mercutio and Tybalt decide it’s time that they share their story with the world. What follows is an epic tale of bromance, full of puppetry and swordplay, that weaves in and out of familiar scenes from Romeo and Juliet. Duncan and Harder stay true to the Bard’s style by performing the show entirely in iambic pentameter, with modern slang included in the mix. In doing so, Mercutio and Tybalt’s vaudeville-inspired antics are given a natural, if not musical, rhythm for the actors to follow. Duncan and Harder have crafted a wildly fun show that works for both friends and acquaintances of the Bard. Harder’s bad-tempered Tybalt is the perfect foil to Duncan’s immature, yet sharp tongued Mercutio. The pair work brilliantly together, delivering a charming performance abundant in wit and attitude. Mercutio & Tybalt captures the spirit of its source material, while delivering something fresh and vibrant at the same time. Audiences will find much to enjoy here, guaranteed. Val Duncan and Celene Harder’s Mercutio Tybalt runs July 31st – August 8th as part of the 2015 Calgary Fringe Festival.